Orlander Daniels was born October 21, 1930 in Mineola, Texas. Orlander entered into peaceful sleep Monday, January 15, 2018. He embarked upon his journey to that city where pain and suffering will be no more. 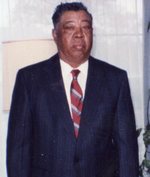 He was born to the union of the late Major Daniels Sr. and Essie Johnson Daniels. He attended Quitman High School in Quitman, Texas. After high school he joined the U.S. Army and served for eight years. After serving his term in the U.S. Army, he came to Mineola, Texas to make a life for himself and his family. He worked for the Wood County as the Superintendent Roads for 27 years. In August of 1995, Orlander was selected to be one of the development board members of First State Bank in Mineola, Texas where he was one of the original stockholders. After retiring, he enjoyed spending time with his wife and family, and driving into town and parking across the bus station where he would meet his brothers before and after work for good conversation and laughs. If you knew Orlander ”Jelly”, you knew he was loving, he was caring, he was a listening ear, he was someone you could count on, and he was a giving person who would do for anyone. He was a member of the Brocks Chapel United Methodist Church, under the leadership of Elder, Rev Clara Gilbert-Love, where he remained faithful until his passing. Preceding him in death is his loving and devoted wife Doris Caraway Daniels; his brothers Major Daniels Jr., Wardell Daniels, Cardell Daniels, Morris Daniels; sister’s Nettie Doss, Margie Re Daniels, Clarice Daniels McDowell; nephew Claude Anderson; niece Essie Cooper. He leaves to cherish his memories: nephews James Anderson and Tommy Vaughn; nieces Clara Campbell, Lynne Reddic, Linda Vaughn, Shirley Anderson, Marilyn Thomas and Doretha Brickmyer, Charlotte Doss, Olivette Farris, Michelle Denise Johnson, Bettye Burleson;; nephew, Robert Doss and a host of cousins, great nephews, great nieces and friends. Visitation will be Friday, January 26, 2018 at Beaty Funeral Home in Mineola from 6:00 pm to 8:00 pm. Funeral services will be 10:00 am Saturday, January 27, 2018 at East Chapel CME Church in Mineola. Interment will follow at Roselawn Memorial Gardens. To send flowers to the family of Orlander Daniels, please visit our Heartfelt Sympathies Store.